KFBK stars are among the long list of entertainment features scheduled to be presented at the President’s Birthday Ball which will open at 8 o’clock tonight in the memorial auditorium. 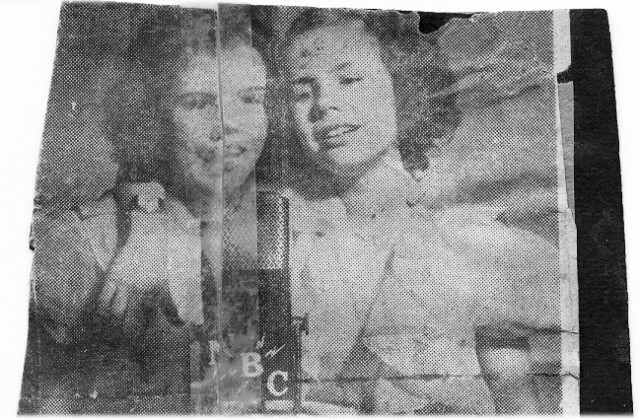 The Brewer sister, Betty, left, and Ilene, shown in the upper photo, will present several of their blues songs. 1937. Courtesy of Shirley Cooper Castle. 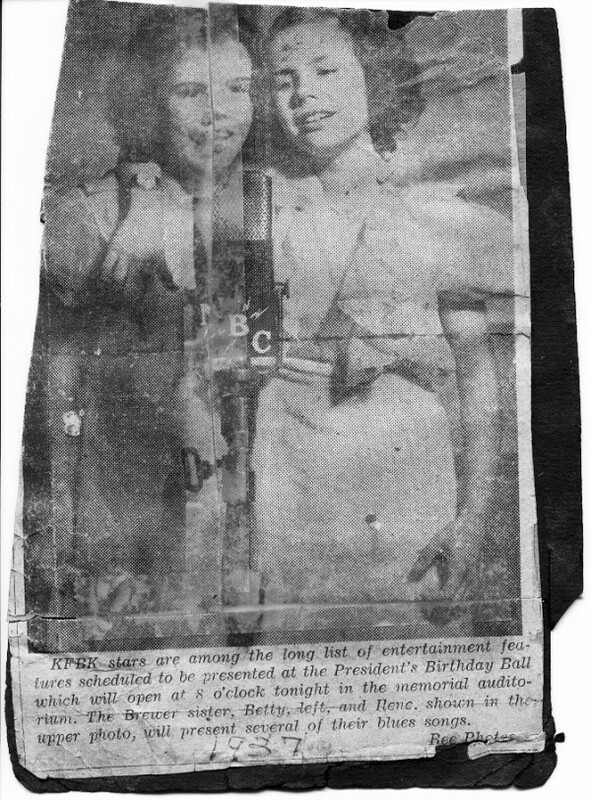 Betty and Ilene Brewer were the daughters of Albert Lafayette Brewer b. 1894 Feb in Missouri, and Lena b. abt. 1905 in Kansas. Albert was a son of John David Brewer and Eva Hall, John David being a son of David Nathaniel Brewer and Delana Fowler. Betty and Ilene were thus second cousins with my father, and first cousins once removed with grandmother Dorothy Noyes. 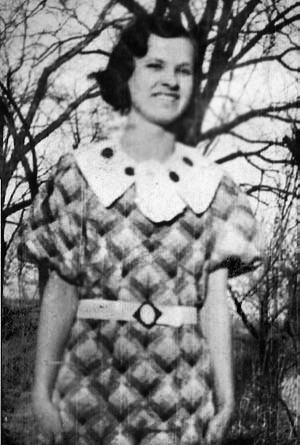 Betty’s film and TV credits at the imdb website are unreliable and confused with another Betty Brewer who was born in Hot Springs, AR in 1922, the daughter of Howell and Lillian Brewer. This other Betty Brewer was also an actress and singer and her family informs me that she was the one who was on the Bill Cullen show. According to IMDB, Elizabeth “Betty” was born Virginia on November 14 1924 at Joplin, Missouri, Ilene was born abt 1927. The Moviekids website gives Sonny’s name as Monte Robert, and that he was born in Lamar Colorado on May 12 1932 and died April 21 1942 in Hollywood. The 1930 census shows also an older sister named Violet. Albert died 1946 in a car accident. The above picture I have labeled as being Betty, but I’m uncertain as to whether it is her or her sister. I seem to recollect the individual (a relation of Betty’s) as being uncertain, but believing it was Betty. I have since lost the emails I exchanged with the individual and can’t double check our discussion on this. Hi, I just wanted to thank you for doing this blog! Ilene was my grandmother and very quite! I know some of her movie career and have all of her pictures from it. Some things though she just did not talk about very much. The one thing I do remember well was that she said Sonny had died of bronchitis. If you would like any copies of the things I have, I would be more than happy to share with you! Thanks again! Bethany, thanks. It’s good to hear from a granddaughter of Ilene. If you have something you’d like to share, please do! Is betty brewer still alive she is a cousin of a family member in Sacramento? Hello, my name is Stephen. I’m Bethany’s brother from the other post. Betty was my great aunt. The last time I saw Betty, I was around 8 years old. She visited us at our home in Simi Valley, Ca. I’m 50 now. If you find out anything, I would be interested to know. Who is family member in Sacramento? My Grandmother is Violet Brewer. My Great Grandmother is Lena.My dad Tommie Lynn Couch was born in Joplin Missouri he lives in Sacramento. If any of you have more information on my family I would love you to please contact me. Violet and Mack were my aunt and uncle. We spent a lot of time visiting them when I was a kid. They were great. I’m sorry. All the information I have on these Brewers is on the website, Tommie. I truly loved your dad Tommie Lynn. I know he passed a while back. So sad to hear that he passed. He was a few years older than I am. He was one of my boy hood heroes. My family (Macfadden) lived on Camerford Ave. in Hollywood in 1938-1940 and Betty Brewer and her family Mom, Sister Ilene and brother Sonny lived in the house in front of us. I have a picture (which I am looking for) of Betty and some of my family sitting on the lawn in front of the house. We also saw Betty in the 1950’s when she lived on El Centro Ave in Hollywood and she had a son named Johnny who I babysat for. I know she had hard times and we tried to help her. I was at her Mother’s apt. in Hollywood once and she gave me some clothes. She was very sweet and I thought she was very talented! We heard that Sonny died of appendicitis because they did not know what was wrong and were treating him for a stomach ache. Our family would like to know what happened to her and her family. I am steve hilton of oklahoma, formerly of california. Violet Brewer Couch was my aunt. She married my uncle Mack Couch. Tommie, Jim and Judy (their children) are my cousins. I think they have all passed on now. Wow! I’m so shocked at all the responses we have gotten! Please if any family or the neighbor who commented have info or pictures contact me at 951-250-8869 or email bethanyruiz@yahoo.com. I’m so very interested in our family history and knowing more about my grandmothers life Seems as if most relatives are in California, I’d even be willing to come out and meet some of our distant relatives. I’m especially interested in the Blackfoot Indian heritage we’ve got. Thanks everyone!